‘Water’ is the most amazing and plentiful substances on this earth.In its natural form, it should be considered ‘alive’. Aqua-Chi Ionic Foot Bath combines the life-giving properties of water with a specialized bio-electric charge, which enhances and amplifies the body's ability to heal. Dramatically increase energy levels and help detoxify your body with the Aqua Chi foot bath. The bio-charge produced by the Aqua-Chi Ionic Foot Bath (also called a detox foot bath) resonates throughout feeling of standing beneath a lush tropical waterfall and being showered with freshest, ion-rich, naturally charged water, creating a profound sense of well-being. 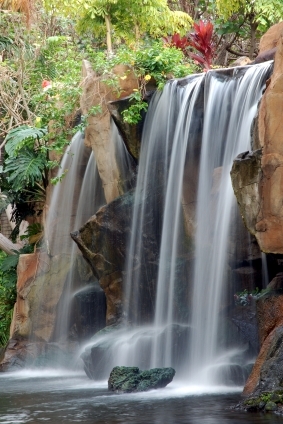 The ions created during a session are similar to those found in hot springs, waterfalls and other naturally charged water sources known to be beneficial to the body. Take care of yourself naturally… without painful treatments or drugs. The bio-charge produced by the Aqua Chi Foot Bath (also called a detox foot bath) resonates throughout the water at a frequency uniquely specific to each individual taking a session. Often a gentle tingling sensation can be felt during the bath. Many of the benefits of the foot spa can be attributed to the re-balancing of the energy meridians and the raising of the bio-electrical potential of the body at the cellular level. Live blood cell analysis with the Aqua-Chi Ionic Foot Bath. Pictured left are two photos of live blood cell samples taken before and after an ionic foot spa soak. The photo to the left shows the individuals live blood cells before the ion foot bath. Note how the cells are clumped together. Amazingly, the picture to the right shows the same blood just 35 minutes later, after the Aqua-Chi Ionic Foot Bath. Some of the best results reported when using the Aqua-Chi Ionic Foot Bath have been with: detoxification, pain reduction, reduced inflammation and recovery time, improved liver, kidney and colon function, as well as improved sleeping patterns. Immediately after a session it is typical to feel relaxed and have heightened mental clarity. However, users report that it is the cumulative effect of the sessions which are the most dramatic, providing a greater long-term benefit. Disclaimer: None of this information and/or the products on this page, Corvallis Colonics LLC, Robin Fajnsztajn are intended to cure, treat, prevent or diagnose disease of any kind. None of these statements or research has been evaluated by the FDA. Need to call us now? We may be with a client.